It is man’s human nature to seek connections with other people, animals or even things. This connection can be defined in terms of a relationship or relation. A relationship is link between two subjects or human beings and is used informally. In the case of human beings relationships are special connections that is either bound by blood or marriage or by a unique union. For example Sophie and her mother Jane have a mother-daughter relationship. A relation is formally used to identify the link between two groups, countries or elements. For example, Two countries can have great diplomatic relations. The term relation is used formally to identify different connections. Relation can be used to show the mutual connection between two different countries. For example, The relations between Britain and US are quite solid. Relations can also indicate people who are related to each other in a specific way. For example, The billionaire invited all her relations to the party, including the distant ones. Relation can also be used to mean one’s personal account. For example, the lecturer was very mean according to the student’s relation. Relation can also be used to identify similarities between two different things. For example, The relation between ether and bitcoin is very imperceptible. Relation can also be used as a reference point when used as a phrase, ‘in relation to’. For example, we wrote the article in relation to the updated regulations and rules posted by the school’s administration board. It can be used in an informal context to link two different subjects. For example, We believe there is a relationship between the ABC gang and the robbery at the bank yesterday. Scientists have been trying to determine the relationship between diseases and causative factors. Finally, relationship is used to classify a couple that is serious about each other. For example, Margaret and Adam are in a relationship. Relation is used in a formal context to define the connection between groups of people, similarity between different elements and to establish a personal account of different subjects. Relationship is used informally to describe connections and linkages that exist between people or elements, to describe behaviour and classify a couple’s intention. Relation can be used to describe similarities and the sameness of two different people, things or countries. For example, ‘The relation between the series the ‘Original’ and ‘Vampire Diaries’ is quite imperceptible. Relationship can’t be used in the same way. Relation can be used as a reference point when incorporated in a sentence as ‘in relation to’. On the other hand, relationship can’t be used as a reference point. Relation is used in a formal context, while, relationship is used informally. 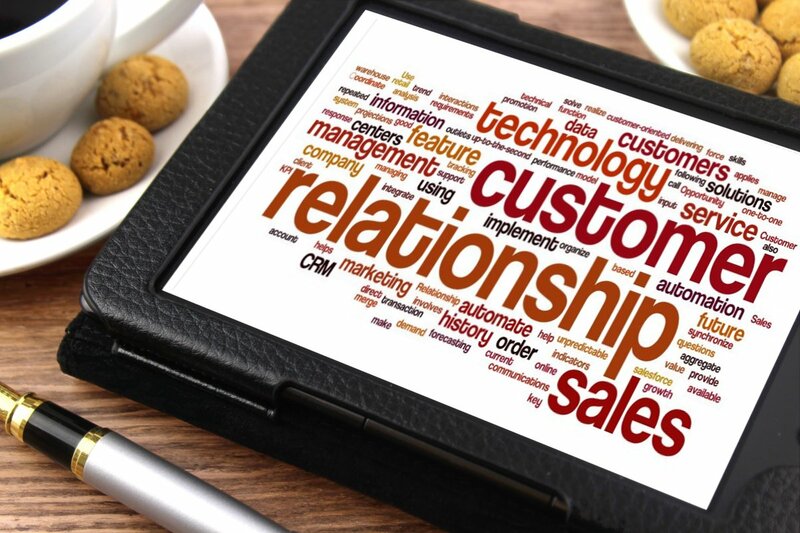 Both the terms relation and relationship help describe some form of connection or link between groups of people, two individuals, non-living things pr elements. Relation is used informally while the term relationship is used in a formal context. Relation can be used to identify the similarities between two different things, groups of people or individuals. Relation is also used as a reference point. Relationship describes the connection between people, their behaviour towards each other and a couple’s mutual status. Evah Kungu. "Difference Between Relation and Relationship." DifferenceBetween.net. 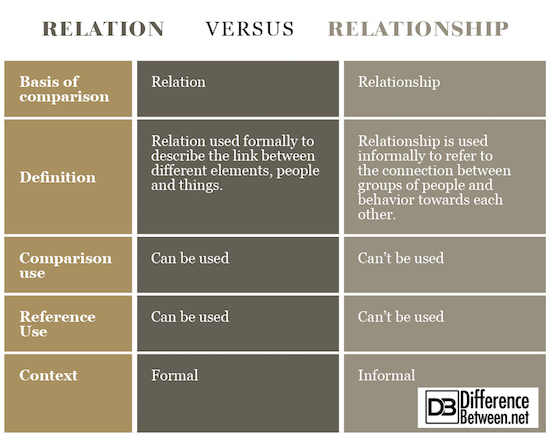 May 22, 2018 < http://www.differencebetween.net/language/difference-between-relation-and-relationship/ >. Lipka, Leonhard. English Lexicology: Lexical Structure, Word Semantics & Word-Formation. Gunter Narr Verlag, 2002. Fowler, H. W. A Dictionary of Modern English Usage: The Classic First Edition. OUP Oxford, 2010. Roberson, B. A. International Society and the Development of International Relations Theory. A&C Black, 2002.